Dating back to the early 19 century, this breed of dog was created by Dr Antonio Nores Martinez, hence known as the fearless big game hunter. It provided its services to the armed forces and the law enforcement agencies.Furthermore, they served well as guide dogs as well as domestic guard dogs. However,Dogo Argentino lost its charm and favor and got discredited due to its untimely misuse in the field of bloodsport dog fighting and eventually got barred under the Dangerous Dog Act UK and Australia in 1991. 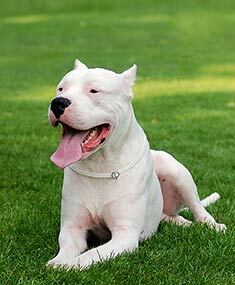 The Dogo Argentino dog is a rather large, white, muscular breed that was created in the earlier part of the 19th century from the Cordoban Fighting Dog,in Argentina, for the explicit use of big game hunting,mainly wild boar due its size and strength. Similar to those of the Dalmation and the White Bull Terrier,the Dogo Argentino also suffers from pigment related loss of hearing. This occurs in almost 10% of Dogos with one ear and some even in both ears.Research has shown decreased deafness,provided the breeding pair have normal hearing.Some studies also show a possibility of hip dysplasia in this type of dog.